This prepaid phone was on sale for black Friday and was just $39.99 which is extremely good value, the phone is normally $89.99. Features include a 3 Mega pixel camera and 3G and Wifi connectivity. 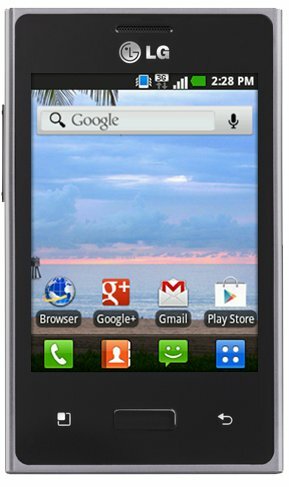 The Android OS version running on this phone is this phone is 2.3.6, and the either the $45 unlimited plan or the $60 Unlimited with international calls plan needs to be used. The screen resolution isn’t high, but for the price of this phone it isn’t an issue. Like any Android phones it has the familiar interface that is easy to navigate. If you’re new to touch screen phones this is a great entry level phone. The plastic outer casing is a metallic looking finish. It plays youtube videos perfectly, no different from any other Android. This phone is operating the AT&T network and the 3G speed are what you would expect from a prepaid phone on AT&T using their own prepaid gophones. The 3MP Camera is good quality and has a number of filters that make the photos look great, sports night. Ports included the standard micro usb charging port and 3.5 mm head phone jack. Included in the package is a charger and a 4GB microSD card that is preinstalled.